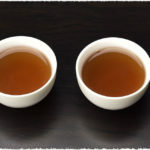 In the time before Taoism is formed, tea was already inextricably connected with Taoist thoughts. Chinese people love tea, drink it for no special reason. Though they are deeply influenced by the traditional cultures, they drink tea for neither religion nor faith. 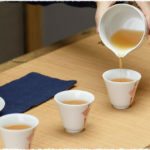 The method of brewing tea is also naturally developed under long period experiences and habits. In Chinese culture, tea is the man in the woods and grasses. How does this come from? The earliest tea garden in records is the Xian Cha Tea Garden (仙茶院), also called as Huang Cha Tea Garden (皇茶园), on Mengding Mountain in Sichuan, China. The 7 tea trees grown there are said to be planted by the father of Mengding Tea, Wu Lizhen in B.C. 53. Taoism scholars chase the unconstrained and free status of no ego. Brewing tea can bring them to such a status. Imagine the ancients brewing tea in a small house on high mountain. The house has a yard and a pavilion. They enjoyed their teas in the wilds, experiencing the benefits from tea for their believing that tea is as a healthy medicine. This is the unity of man and nature. The word 茶 is made up of three components: 艹 (grass), 人 (human), 木(wood). 人 is in the middle of 艹 and 木. It embodies the essence of Taoism: the unity of man and nature. Mengding Mountain is located in Mingshan County near the city of Ya&apos;an. In the early Spring on March 9, 2013, TeaVivre visited the Mengding Tea Garden in Mengding Mountain, Ya’an, Sichuan, China. 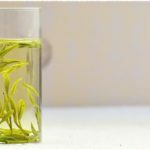 Chinese tea wares are popular among tea lovers for its abundant varieties, elegant appearance, as well as practicability and connoisseurship value. The Chinese Gongfu way of brewing tea demands three common tools: gaiwan, pitcher and teacup. Gaiwan is also called as gaibei (盖杯), which is made up of three parts: the cup, the lid and the saucer. We regard the lid as heaven, the saucer as earth, and the cup as human. Three parts combines into a complete gaiwan, indicating the unity of heaven, earth and human. Taoism has a saying, 上善若水: The highest good is like that of water, which benefits all things without striving for fame. 上善 means the highest good; 水 implies sages who lives harmoniously without evoking conflicts or resistance. Water nourishes the livings in the world, benefiting the nature with its good. In the same way, the cup offers the delicate tea to everyone else. It is regarded as human, implying that we should behave like the water. Why making tea requires a peaceful heart? It is specially demanded in modern society. A thriving city is very busy. People living in this fast-paced environment often feel stressful. Taoism devotes particular care to the balance between tension and relaxation. Applying to modern life, we can take a break to relax our eyes after using the computer for hours. Or find time to enjoy a cup of tea with a peaceful heart, to relax the body in the intervals of heavy works. We believe that brewing tea is retracing its process. During processing, tea workers desire to make the tea that can mostly remain its original aroma and flavor; while after the processing is completed, tea drinkers would wish to taste the best aroma and flavor. To achieve their goals, it requires not only rich experiences for brewing the tea, but also a peaceful mind to taste its flavor. Nevertheless, this balance indicates the Taoistic idea of the unity of man and nature – that to relax your heart and mind to feel the nature. You may take a day to relax yourself, to bring peace into your heart.